After slicing myself good last night (only $50 at the ER to glue my finger back together ) I am looking into a different ruler. While I was using a metal ruler, I think it was too thin and narrow to be of good use. I am am looking at the AlumiCutter. But I spotted this guy while browsing online. And I was curious if any has tried it. It looks like this will make it hard for me to slice myself. But for its price I wanted to see if anyone had good things to say about it before I make the plunge. Know anybody with a welder and chop saw? You could build one of those out of scrap metal and a standard metal ruler. Throw on a rubber or cork backing and it's a done deal. I got the Testrite Safety Edge a couple of days ago, and while a bit pricey it does a good job. I think the only complaint is the bottom rubber can pick up cardstock scrap pieces, so every so often you need to clean it off. Other than that I really like it. I use the standard Staples branded metal ruler. It does a wonderful job. You might have some folks call dexterity. Me, I trip over my own two feet at least once a week. Quick tip that worked well for me last night. I had a new steel ruler and it was just a bit slippery on the paper leading to shifts or excess pressure and tired hands. After a few minutes in the garage trying to find something thin but grippy I ended up grabbing my sander and running that over the surface of the rule with some 120 grit. It worked great, added zero thickness, and was free. Much happier now that I have a grippy steel rule that sits right on the paper. And I found this monster (tempting), but I got the much smaller version. But very cool! It's non-slip and both sides facilitate cutting. One is flat while the other is inclined. It's the cutting mat in the picture that has me drooling, though. Mine easily accomodates A4 cutting (cost me all of all of a dollar, so I can't complain), but having more elbow room can't hurt! 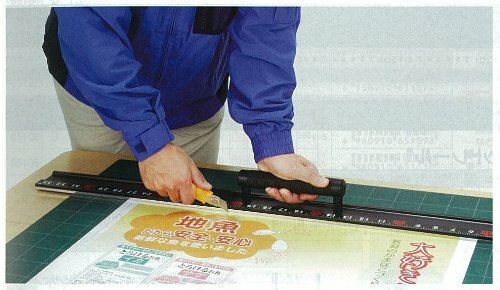 I have a large cutting mat after using a fairly small one for a long time. It was well worth the money. 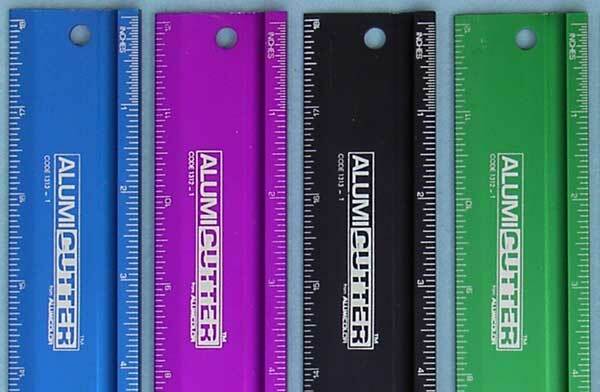 I was using a small (ie thin semi flexible) steel ruler that was 12 inches in length that I had purchased back in '95 for my drafting class that I took my freshman year of high school. that Chris (Mel Ebbles) was selling on his old site, I got mine in the Starter Kit he was offering. I love it, and am thinking of getting an 18 inch one and a 48 inch one (the 48 inch one will be used for when I am cutting mats for photographs I am framing). 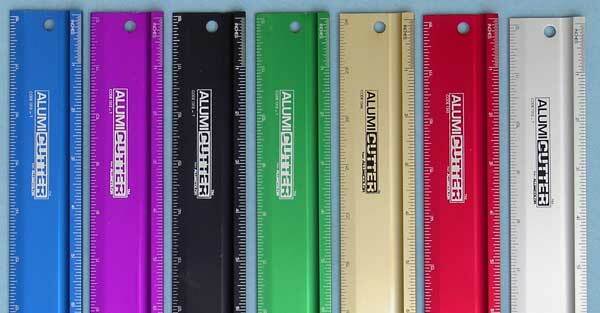 I am also a big fan of the Alumicutters...great rulers for cardstock.